You know, sometimes you don’t really appreciate something, until something much worse comes along. Which brings me to the topic of our new friends: Flies. Backflies and horseflies to be exact. We met them for the first time near the top of Dicks Pass after hiking out of Echo Summit. It was a “nero” day for us (basically at this point anything under twenty miles is considered a nero day) and we just needed to get out far enough to make the days into Truckee doable. After leaving Echo Summit we headed down to Echo Lake and shortly after that we saw a sign informing us that we were entering the Desolation Wilderness. 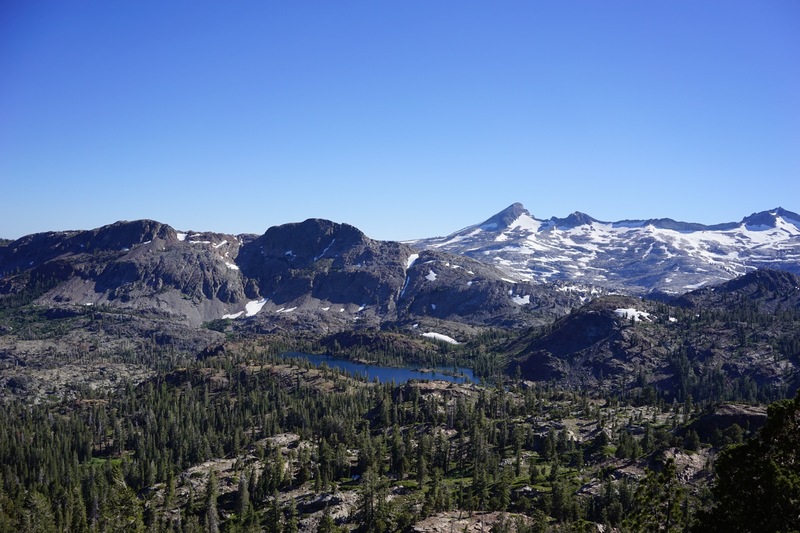 So THAT’S where the Desolation Wilderness is. 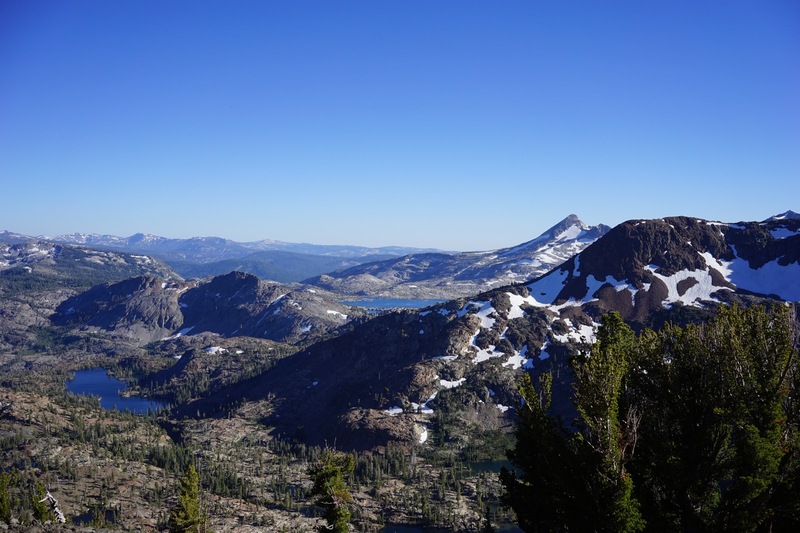 A little backstory, when you are hiking the PCT (or maybe this is just us, or maybe this is just our lack of knowledge about California) you really have no idea exactly where anything is. We hear about things that are up trail, somewhere, in the future… But usually we don’t actually know where things are until we are getting really close to them, or if they are just boundaries, until we get there. The crappy thing about not knowing where the Desolation Wilderness was is that a friend of ours from ACE, Kristine, is working there this summer as a backcountry ranger and we had been hoping to be able to meet up with her. 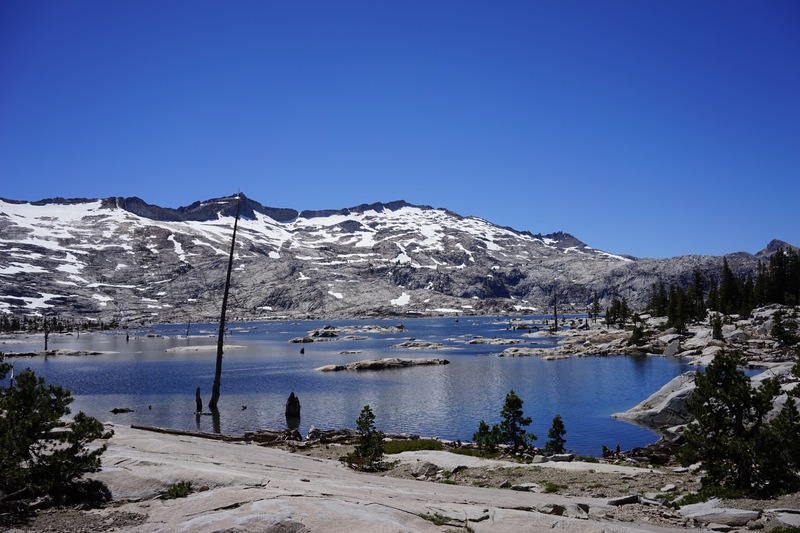 So there we were, standing at the Desolation Wilderness sign, no cell phone service to speak of, feeling like idiots. Time to do a better job knowing what is going on around us. We kept our fingers crossed she would be out on patrol. 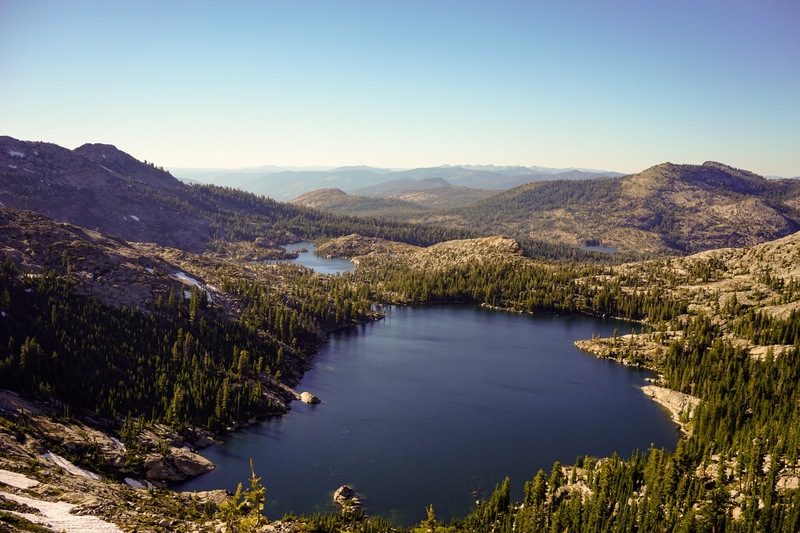 The first part of the day in Desolation Wilderness was stunning, especially Aloha Lake, which is dotted with hundreds of granite islands topped with pine trees. After Aloha Lake the trail dropped down in a valley and we passed lake after lake, taking our time on the rocky terrain. We had two camping options, one before Dicks Pass and one after and around mid day we were feeling lazy enough that we decided we would just stop at the earlier one. That plan was thwarted when we somehow passed it and didn’t notice until we had hiked another mile. A mile is much to far to hike back so we shrugged our shoulders and kept pushing to the further campsite next to Dicks Lake. Our final break was near the top of the climb at a water source. It was during this break that we met our new friends, the blackflies. Imagine, if you will, a fly about a quarter the size of a regular housefly. Now imagine that it can move about three times as fast, and comes in a cloud of about five hundred flies. Oh, and it bites. Continue playing out the scenario and you will see Kyle and I, sitting down to enjoy a bar and a handful of dried mango slices, become enraged when a cloud of flies encircles us and begins attacking. 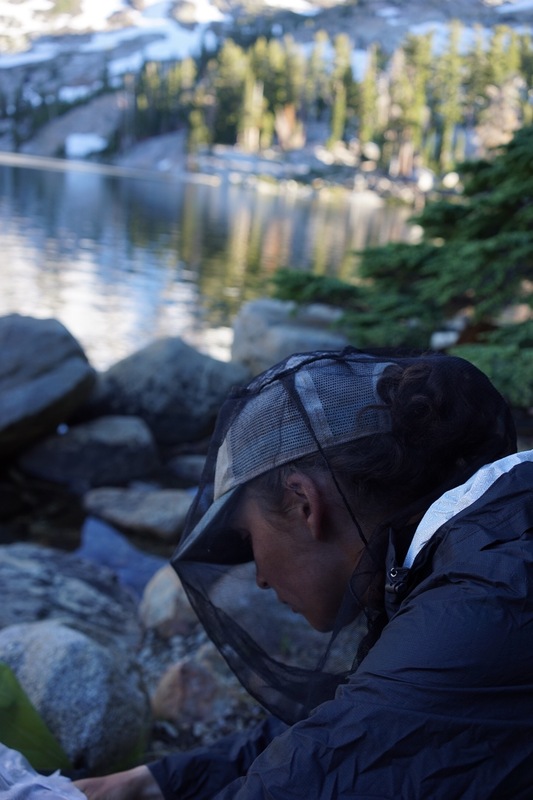 The headnets came out and the DEET went on, but the DEET had little to no effect on the blackflies, the only thing that seemed to deter them was movement (they aren’t very fast) and so our break was cut down to nonexistent as we took our bars and ran down the trail. We might have actually wished for the mosquitos back. At least mosquitos respect DEET. Up and over Dicks Pass we went and down the other side to Dicks Lake where we immediately donned all of our rain gear and our headnets and stood still, waiting to see what would happen. 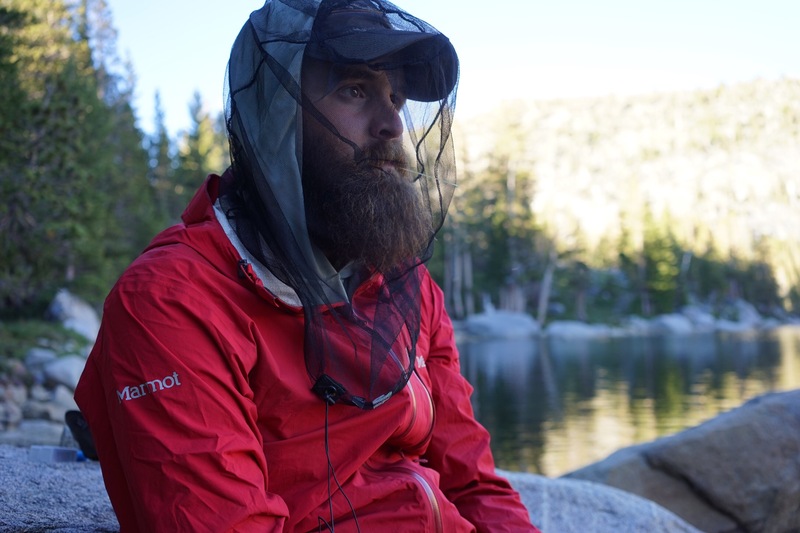 Nothing really happened, the bugs weren’t as bad by the lake as they had been up above, but we kept on our bug armor just in case. We cooked an incredible (and giant) angel hair pasta meal down by the lake, complete with a home-dehydrated sauce, zucchinis, spinach, mushrooms, and freeze dried sausage crumbles. It felt like an extravagant amount of veggies. When we had been in SLT we had bought some replacement bear hang rope since we had lost ours. That made Dicks Lake the first night we were able to hang our food, and I was determined for us to use the PCT bear hang method. I had done it a couple of times before so I showed Kyle what was up. The most challenging part of the bear hang was finding an appropriate branch. Many of the forests we are hiking through and camping in lately are very scrubby short pine tree forests, where the pines all grow closely together and their branches are stunted and down turned. It took us forever to find a branch that would suffice and once we got the bear hang hung we stood staring at it, trying to decide if it was tall enough. Kyle was able to swipe it with his outstretched fingers so the question really was: How big are the bears on the PCT? From our tent we couldn’t see our bear hang so we surrendered it to the night and prayed for tiny bears so that we wouldn’t have to turn around and hike the seventeen miles back to SLT the next morning. Also, turns out you can eat Angel Hair pasta uncooked through a headnet. Beautiful landscape. Too bad about the pesky flies, however. 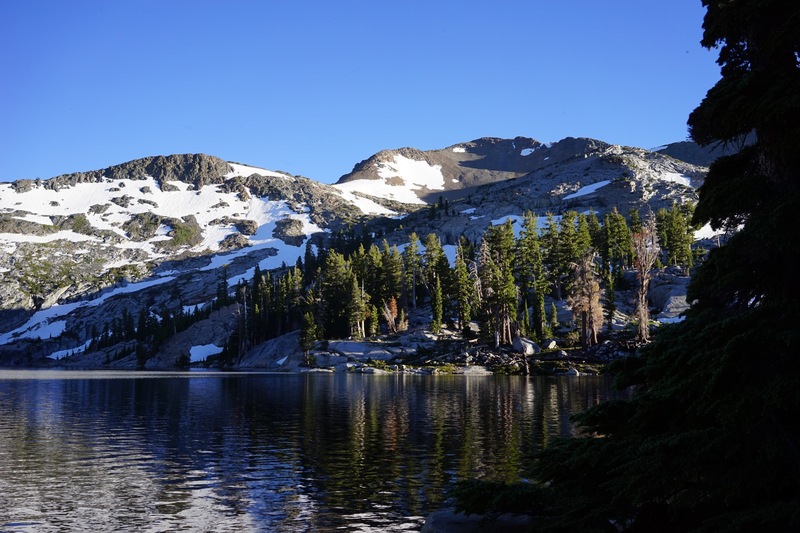 My family has a cabin near the Desolation Wilderness. This is the first year we have experienced the biting flies. In fact they got me weekend before last. Previously we only had to worry about mosquitoes. They are awful and I am still healing from my bites. Considerably more painful than mosquito bites…the little jerks. “Much too far to hike out”.